Happy Cinco de Mayo everyone! I am having an all Mexican food themed appetizer, dinner, and dessert meal this evening. Our neighbors will join us, in addition to, bringing some Mexican themed beverages and side dishes. In the spirit of today I figured I would share what I am making for dinner, tonight, as well as one of my favorite Mexican dishes to make and eat. That dish would have to be, Verde Enchiladas. To be more specific, the “verde enchiladas con pollo” from La Unica, on the north-side of Chicago. The first time I went to La Unica, was for my friend, Brittany’s birthday, I believe sophomore year of college. It was a surprise when we arrived at the location, I knew it was a grocery store, but had no clue there was a restaurant in the back. A restaurant that serves multiple Hispanic culture types of food. And you know the food is legit when the entire menu is in Spanish too. In a bowl, clean your chicken with vinegar, rinse and drain all liquid. You will now season your chicken with your desired seasonings. 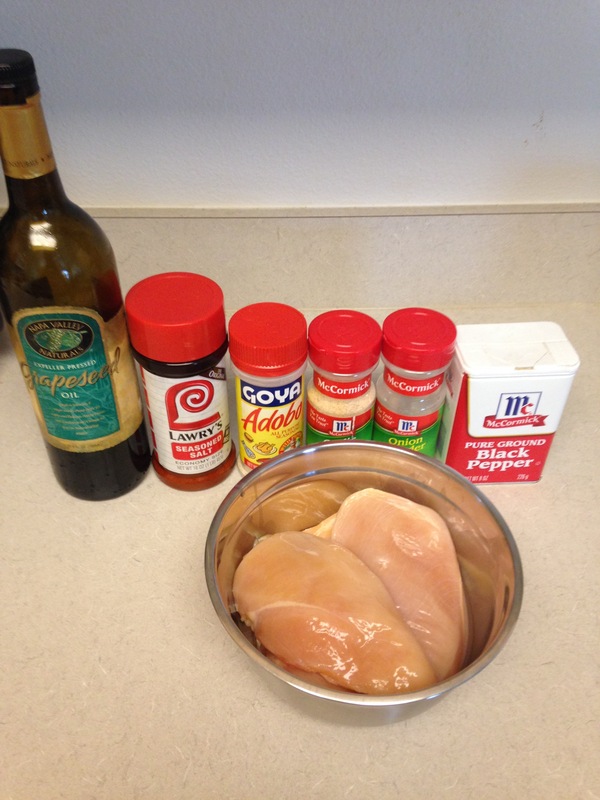 I don’t measure my seasonings for the most part, but if I had to estimate how much of each to use, I would say use at least one teaspoon of each seasoning on your chicken breasts. I highly recommend using Adobo as one of your seasonings. Now, you will heat your 2 Tbsps of grapeseed oil, in a pan over medium high heat, and brown your chicken breasts on both sides until both sides are golden brown. Once both sides have been browned, turn the heat down to medium-low heat and let the chicken breasts cook on the lower heat for about 20 minutes. While your chicken is cooking, peel the husks off of your tomatillos and clean them in a bowl with warm water and vinegar until all of the stickiness from the husks has been cleaned off. Fill a medium sized pot a little over half way full with water, add your teaspoon of garlic to the water, and bring to a boil. 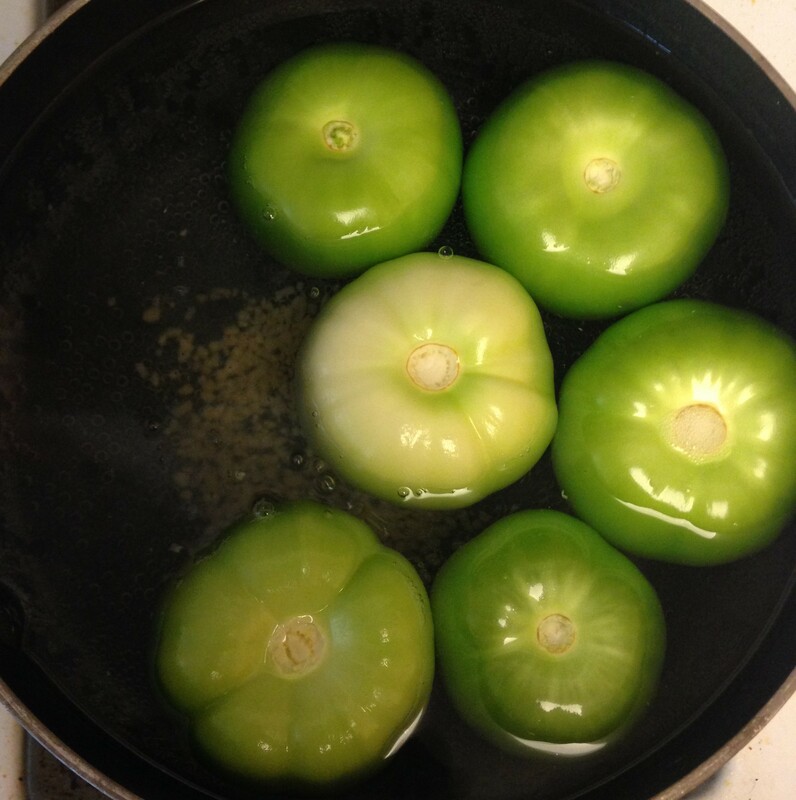 Once the water is bubbling up to begin to boil, add your tomatillos to the water and let them boil until they are a pale green color. I usually let them cook for about 10-15 minutes. Once the tomatillos are finished cooking add them to a blender along with half of your white onion, jalapeno pepper, and cilantro. 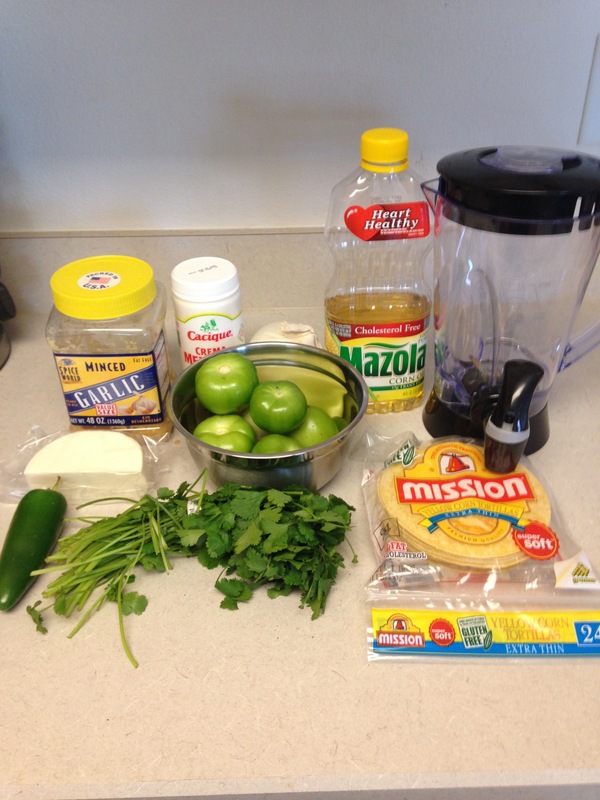 Blend all of these ingredients together until they are smooth like a verde sauce. If you want your sauce to be a little thinner, add some of the water from the pot you boiled your tomatillos in to the blender. Add salt and/or pepper to taste. 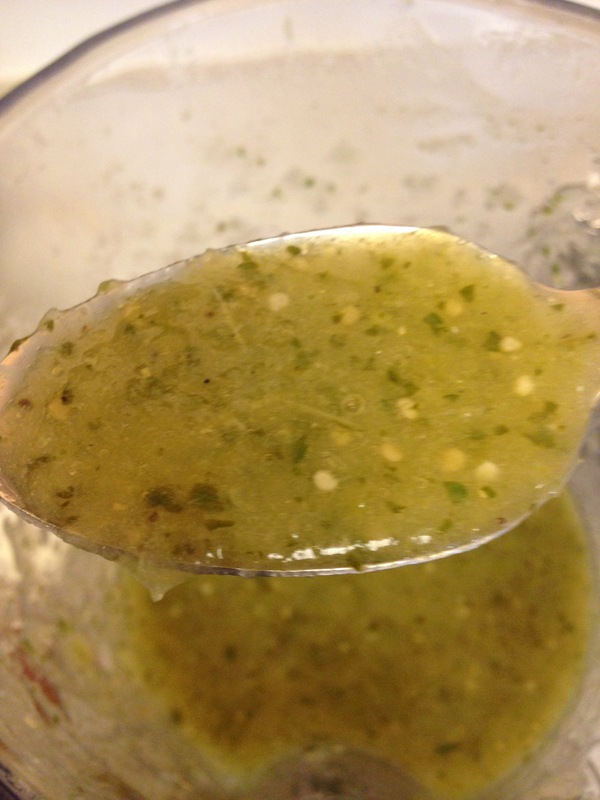 I prefer to use sea salt for my verde sauce. Preheat your oven to 350 degrees. Your chicken should be done cooking by now. Take the chicken breasts out of the pan and put them on a large plate. Since they are still hot, take two forks or a fork and a knife, and shred the chicken on the plate until all chicken breast pieces have been shredded. Sit your shredded chicken to the side and let it cool off a little bit. While you are waiting for the chicken to cool off, in a separate pan on medium high heat, put a tablespoon of the corn oil in the pan, and let it heat up. 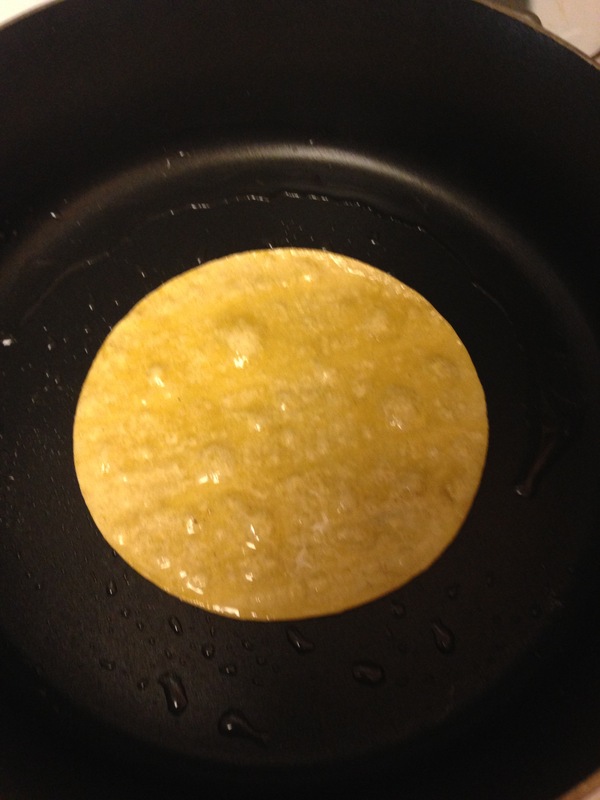 Once the oil is hot, you are going to quickly put your tortilla in the oil on both sides for about 10-15 seconds. 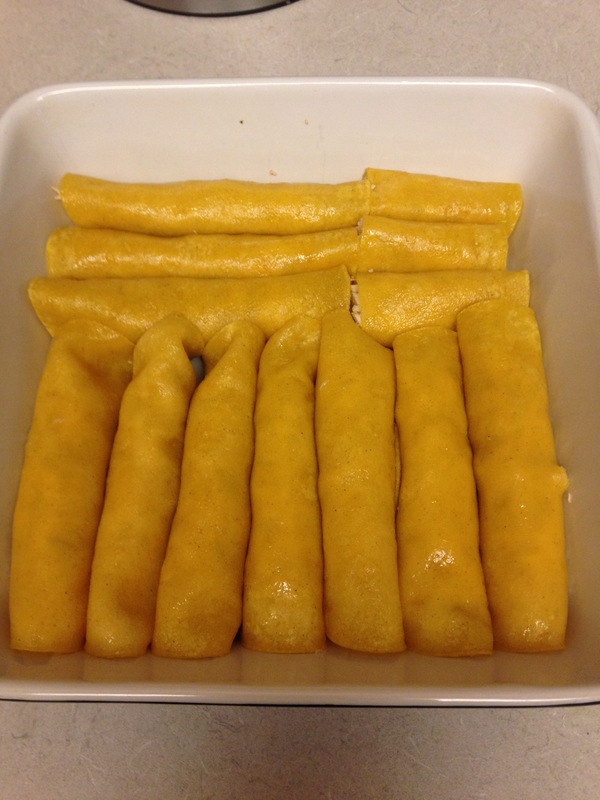 You want to be sure you aren’t cooking them until they are hard, because you won’t be able to roll the tortillas up without them breaking them if you do. After you have done this for all 12 tortillas, stack them on a plate and set to the side next to your chicken. You will not shred your queso fresco, and cut your remaining white onion into pieces. 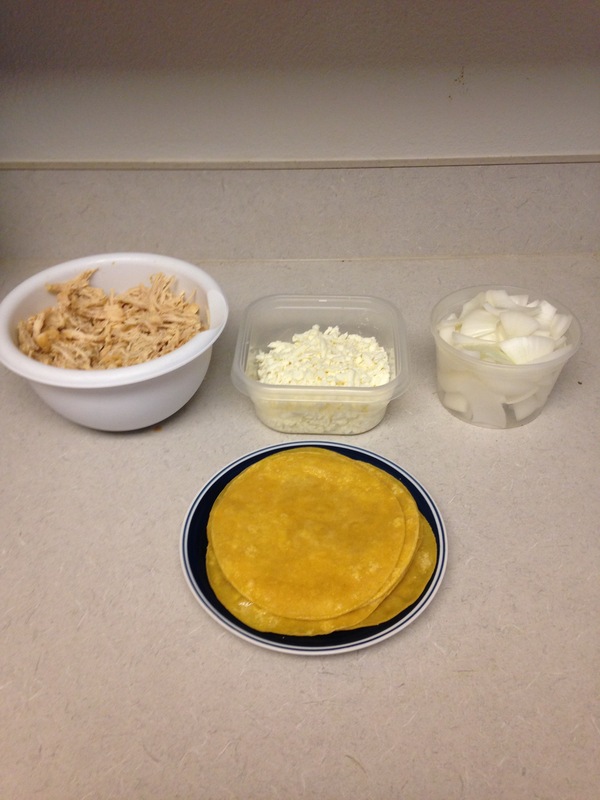 Place both items in separate bowls and place next to your shredded chicken and shredded queso freso. 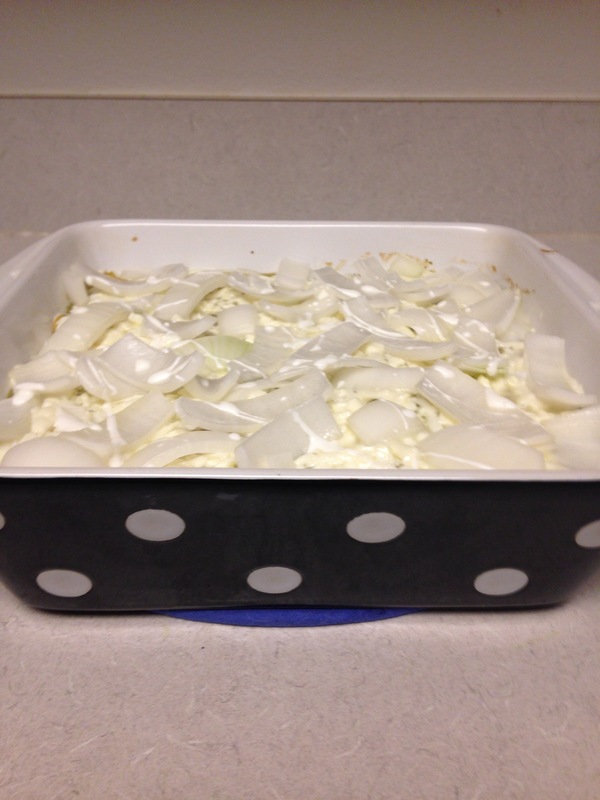 Get a 9×9 baking dish and wipe the inside of it with corn oil using a paper towel to help prevent any unnecessary sticking. Take a tortilla, place the desired amount of shredded chicken inside, roll it tightly, and lay the enchilada in the baking dish with the open end of the tortilla face down. Repeat and do the same for all of the tortillas. If your 9×9 baking dish is like mine, you will need to cut your last enchilada in half and place the two pieces in the corner of the baking dish.